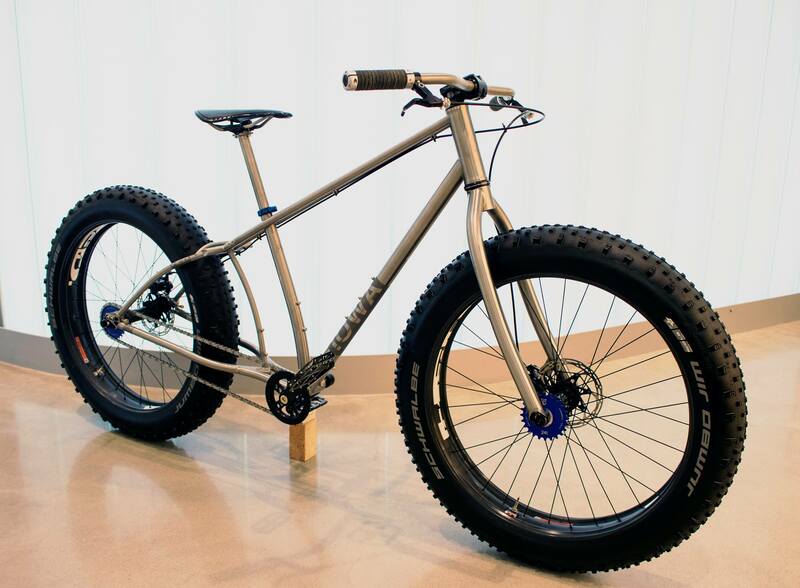 This bicycle frame, designed and built by UI art professor Steve McGuire, won Best Mountain Bike, Singletrack Choice Award, at Bespoked 2017, an international show for bicycle frame builders held in Bristol, UK. Steve McGuire, professor of metal arts and 3-D design and Studio Division coordinator in the University of Iowa School of Art and Art History, has won one of the most prestigious awards a bicycle frame builder can receive. A bicycle named ArrowHED, designed and built by McGuire, was selected as Best Mountain Bike, Singletrack Choice Award during Bespoked 2017, Europe’s premier handmade bicycle exhibition featuring bicycle designers and builders from around the world. McGuire and UI graduate student Billy Cho attended the show April 13–16 in Bristol, United Kingdom. He was one of 100 frame builders selected for the show. McGuire designed and built ArrowHED for his use at the Arrowhead 135 and Iditarod Trail Invitational ultramarathon cycling events. McGuire heads the UI’s Hand-Built Bicycle Program, a semester-long class in which students design and build their own bicycle frames.